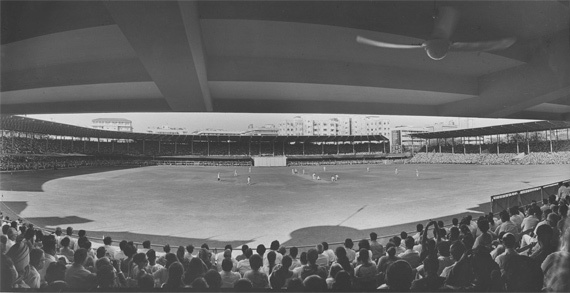 Hotter than a Mumbai curry – Smokey Mumbai Cricket Stadium | The International Cricket Hall of Fame. 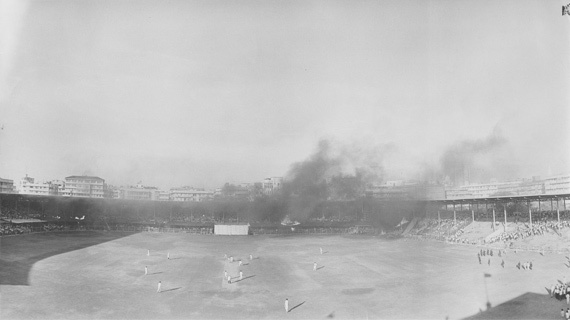 Such was the atmosphere in the 1969 Test between Australia and India, that the crowd turned violent, setting alight cars and other equipment to send smoke billowing across the Mumbai stadium! On the fourth day of the test, Indian batsman Venkataraghavan was given out by a dubious call from umpire Shambu Pan, caught behind by Taber off Connolly. Radio commentators said that Bill Lawry, Australian Captain at the time, should show some sportsmanship and call back the batsman. This triggered spectators listening both in the stadium and outside on radios, to start rioting. A barrage of objects were hurdled towards the ground including rocks, bottles, and fruit, forcing the next batsman to delay coming out for 10 minutes! Eventually he came out, accompanied by the Chief of Police! Behind the stands, cars, tennis nets and other equipment were set alight by the crowds, causing a thick smoke screen across the field, that the scorer complained that he couldn’t see the match. What cricket match have you been at where the crowd atmosphere was tense or electric? Both good and bad.